The resort city of Palma in Majorca is restricting alcohol in some popular areas, including the beach, in a drive against drunk tourists. Police will be able to fine them up to €3,000 (£2,565; $3,406) for anti-social behaviour from 1 April. Bars, clubs or restaurants breaking the rules can also be fined. They must not promote any drinking in the street. In the most popular waterfront areas of Palma de Mallorca there will be no more happy hours or two-for-one offers. Majorca has long been a magnet for young German and British tourists, who often drink heavily and enjoy rowdy late-night clubbing. The neighbouring island of Ibiza also has a reputation for hard-drinking young partygoers from Northern Europe. 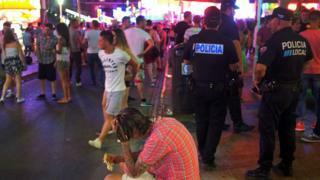 Alexandra Wilms, spokeswoman for the Balearic Tourism Ministry, said the two main hotspots for anti-social heavy drinking were Playa de Palma - the long beach east of Palma - and Magaluf, 18km (11 miles) southwest of the city. The new restrictions, imposed by city hall, apply to Playa de Palma and four central zones in Palma, but not Magaluf. Last year there were at least 15 cases of drunk tourists falling from balconies in Majorca - and in eight cases the falls were fatal. Most involved British tourists in Magaluf. In Palma, Ms Wilms told the BBC, "local people have been complaining for years that something has to be done". "The problem is drunken tourists gathering and fighting in the street - locals wake up and see vomit, litter, broken glass." Last summer Palma introduced a ban on flat owners renting their apartments to travellers without a permit from the Balearic Tourism Ministry. Tourism accounts for 42% of the Balearic islands' economic output (GDP), Ms Wilms said, and there is a drive now to promote "better-quality tourism, for people who want to enjoy the area, the culture - not just coming to get drunk on the beach". Spanish media report that tourism to the Balearics has grown in recent years: in 2017 the islands hosted 16 million tourists, half of them from Germany and the UK. That was 6.3% more than in 2016, which had been a record year. For Majorca alone in 2017 the total of tourists was 11.6m, of whom 4.4m were Germans and 2.3m were British, a Balearics economic website reports (in Spanish). Tourism to Ibiza and Menorca is dominated by the British. In Magaluf many hotels have carried out major refurbishments in recent years, partly to attract more upmarket tourists. Spain's El Mundo daily says Balearic hotel businesses have invested €1.5bn in renovations in the past seven years. The tourism ministry is "creating products for the tourism we want - such as gastronomic experiences - and cultural visits are being expanded", Ms Wilms said. The challenge now is to spread tourism more evenly throughout the year, she said, as the peak summer season is already filling Majorca's hotel rooms. A more even spread of tourism would also create longer - not just seasonal - contracts for hotel and restaurant workers, she said.